The bag sealer puts the power to seal bags into your hand. Simply turn on, press over the opening and slide along. The plastic melts together creating a seal, and there is a built in cutter to make a neat job. Unlike others you may have tried, this one is safety conscious. The heat sealing strip is mounted on a switched platform. Press and it heats up. Don`t press and it does not. The bag sealer works from two AA batteries. As well as food storage, these can be used to keep all sorts of bitty things like screws or reels tidy. You may find heat sealing bags as handy as an often mislaid stapler is for stapling paper. The manufacturers have thought of that. These resealers contain a strong magnet so you can leave them on the fridge. What the manufacturers may not have thought of is a years swap out guarantee, which we are happy to include. 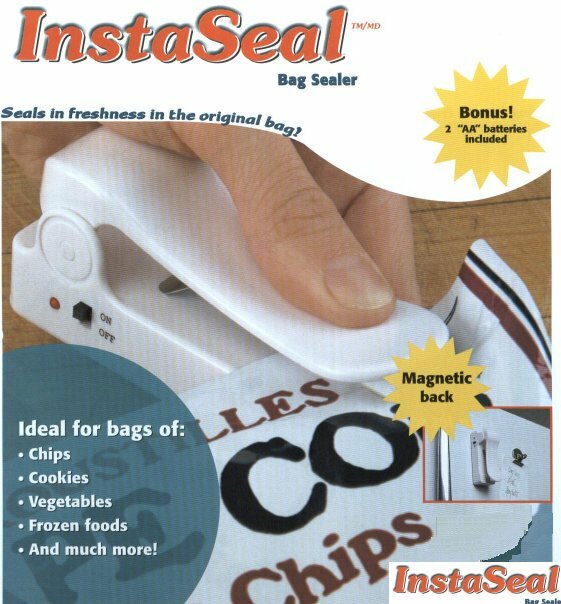 Bag Sealer text, images and video are copyright.